Morrisons offer the best in affordable food, balancing price with quality and pride themselves on giving their customers exactly what they want. Whether its their array of fresh products or plethora of non perishable foods, they aim to please. Maybe you’re planning a meal that you need a special ingredient for, or simply forgot to get something when you were doing the big shop. Or maybe you just didn’t get a chance to pick something up on your way home. Pinga can save the day! Do you need a key ingredient for what you’re cooking today? Have you run out of loo roll? Do you fancy a bit of chocolate? Let our Pinga Partners do the hard work. They are local, can grab whatever you need from Morrisons and deliver it straight to your door. It’s really easy to do. Simply download our Pinga app and put out your request. A trusted Pinga Partner will respond straight away, check the details and go and get your request. Payment will go through the app and now all you need to do is wait for it to arrive. You don’t need to worry about a minimum payments and buy things that you don’t really need. Just order exactly what you want – large or small – without being penalised with Pinga. Our Pinga partners love the sense of community that it provides, meaning that your request will be delivered swiftly, with a smile and with the same amount of care that you would. Although Morrisons offers you a wide range of products, we understand that you might want something from a different shop or supermarket as well. No problem! Just order it through Pinga and our partners will pick that up too! It’s quick and easy to get started with Pinga, and we can’t wait to have you here. So, here’s a closer look at our service and how it works. Pinga delivers any items from Morrisons today. 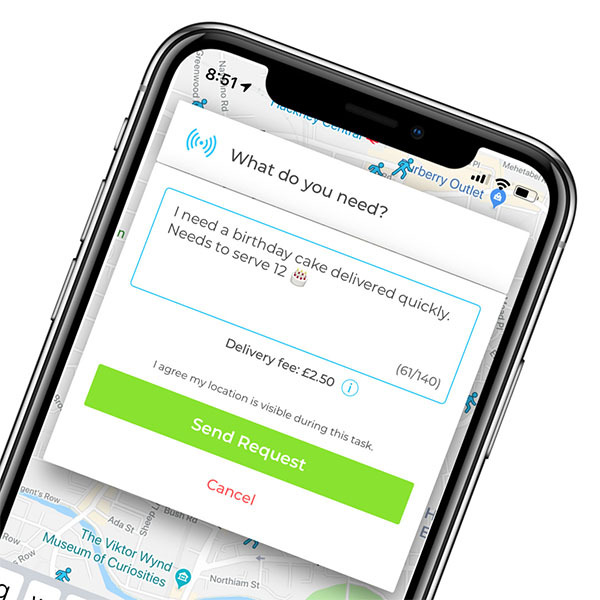 Infact our service normally delivers within an hour, so if you’re looking for same day delivers from Morrisons, send your request via the Pinga App. Describe what items you needs to be delivered from Morrisons and send your request. Pay securely within the app and receive your Morrisons items to your door!